If you've just bought a 2014 Honda Odyssey, I hope you're sitting down. Do you know on what side of the car your Odyssey tailgate badge is? It could be on the wrong side. 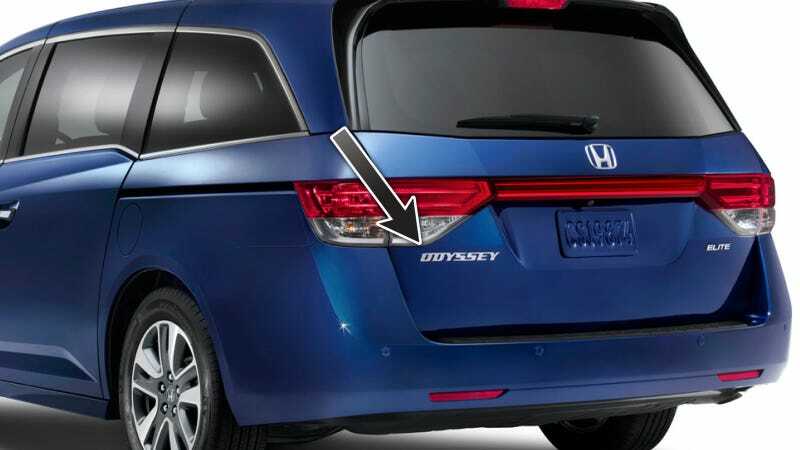 Consumer Reports reported today it received a letter from Honda telling them the 2014 Odyssey they purchased for testing may have left the factory with the model badge glued to the wrong side of the tailgate. The placement of the emblem may indicate that the vehicle has had repairs performed that are consistent with it being in a crash. This could affect the resale value of the vehicle. Dealerships were issued a service bulletin on this back in August, and it's uncertain how many vehicles were affected at one point by the misplaced badges. The initial response both we and Consumer Reports had was that Honda's letter to customers was just a big waste of stamps. When a company sends you a letter about one of their products you recently bought, you expect it to be a big defect and a good reason you should get up early to go wait in a service lounge with nasty coffee while your car is being fixed. Sticking on some new letters doesn't warrant that inconvenience. But Honda might have something with the resale point. When you see a car with a badge in what you think is the wrong place, don't you get a little skeptical of its vehicle history. From personal experience, I've passed over perfectly nice-looking used cars because of some chrome letters that were either missing or in the wrong spot. If you're trying to sell your Odyssey a few years from now, you don't want to have to explain this, do you? What should you do here? If you're just going to crash your Odyssey anyway, don't bother with this notice. If you care about resale or are just detail-oriented anyway, head down to your helpful Honda man.